There were 638 press releases posted in the last 24 hours and 153,971 in the last 365 days. 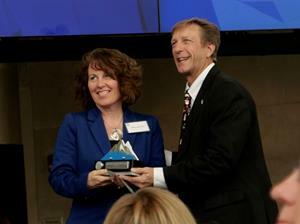 Catalyst Space Accelerator Program Director KiMar Gartman (left) accepts the Colorado Business Roundtable Champions in Industry Award for Aerospace on behalf of the Catalyst Space Accelerator Team. The Catalyst Space Accelerator Team – consisting of Air Force Research Lab Space (AFRL) Space Vehicles Directorate, Catalyst Campus LLC, Center for Technology, Research and Commercialization (C-TRAC), the Boulder Small Business Development Center (SBDC), and Colorado Procurement Technical Assistance Center (PTAC) – is thrilled to announce that the Catalyst Space Accelerator has won the Colorado Business Roundtable Champions in Industry Award in the Aerospace category. The Catalyst Accelerator is a defense and national security industry accelerator, headquartered on the Catalyst Campus in Colorado Springs, Colorado. The accelerator’s mission is to promote technology advancement for the warfighter and guide technology transfer from the government to the commercial market and vice versa while providing a robust, mentor-driven curriculum for accelerator teams. The Colorado Business Roundtable defines a champion as “an individual or organization that works with vision, resiliency, and innovation to resolve issues within the community of Denver and the surrounding communities of Colorado.” 1 According to the Colorado Business Roundtable, the Aerospace category represents “a critical part of the US economy, supporting effective national security and inspiring global cooperation as humanity explores the frontier of the cosmos. Colorado is a national leader with the highest number of aerospace jobs per capita of any US state.” 2 Catalyst Space Accelerator operates at the leading edge of aerospace research, bolstering the local aerospace industry. Accelerator Team member C-TRAC was also a nominated as a finalist in the Government category for their extensive programming conducted in collaboration with multiple Air Force customers and on behalf of the warfighter. Air Force Research Lab Space (AFRL) Space Vehicles Directorate – With an office on the Catalyst Campus and headquarters at Kirtland Air Force Base, N.M., the Space Vehicles Directorate serves as the Air Force's "Center of Excellence" for space technology research and development. They provide the funding to execute the Accelerator and determine the problem statements that drive company applications and selections for participation. Catalyst Campus LLC – The Accelerator is housed in downtown Colorado Springs at Catalyst Campus, whose collaborative ecosystem is where industry, small business, workforce training, entrepreneurs, startups and venture capital intersect with Colorado’s aerospace and defense industry to create community, spark innovation and stimulate business growth. Center for Technology, Research and Commercialization (C-TRAC) – A 501 (C)(3) nonprofit organization that bolsters the economy by bringing together government, education and industry partners to meet defense needs at market speed, C-TRAC works with private industry, academia and government experts to develop solutions for national defense. Boulder Small Business Development Center (SBDC) – Providing Catalyst Space Accelerator with their well-known Economic Gardening curriculum, Boulder SBDC’s mission is to help small businesses grow and prosper in Boulder County. Colorado Procurement Technical Assistance Center (PTAC) – Working with the Catalyst Space Accelerator to provide mentorship, counseling, training and expert government contracting advice, PTAC is co-located on the Catalyst Campus with the Catalyst Space Accelerator. Now recruiting for their third cohort, Catalyst Space Accelerator hopes to become a permanent fixture in downtown Colorado Springs. For more information, visit https://www.catalystaccelerator.space/.